New Delhi : Four-time Goa Chief Minister and former defence minister Manohar Parrikar has been cremated with full state honour. The 63-year-old political leader took his last breath at his son's residence in Goa after losing a battle against the pancreatic cancer. 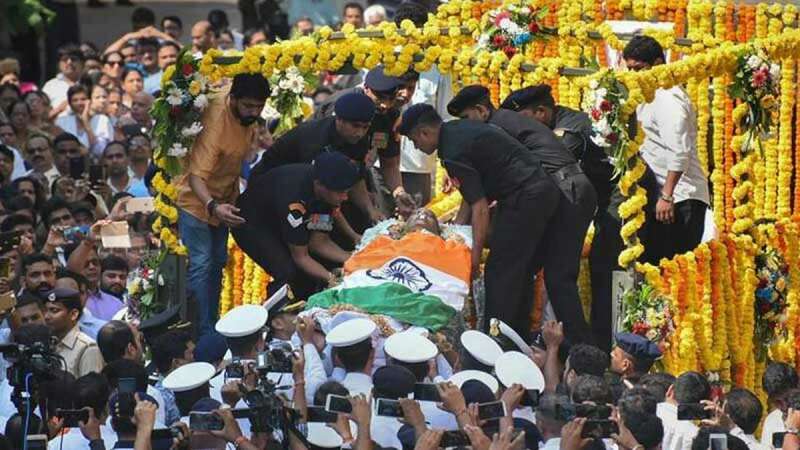 His body was kept at the BJP head office in state capital Panaji in the morning where people paid their final respects to him from 11am to 4pm at Kala Academy. The funeral procession of Goa chief minister Manohar Parrikar began in Panaji on Monday, with thousands joining the cortege to bid him a fond farewell. As the vehicle carrying his body travelled 5 km from his private residence in Dona Paula to Panaji in the morning, people tried to catch a glimpse of the leader, who rose from the small coastal state to become the country's defence minister. Prime Minister Narendra Modi paid tribute to Parrikar the Kala Academy and met his family members and offered his condolences to them. Defence minister Nirmala Sitharaman also met Parrikar's family members.